When you are on the ground working on an airplane that flies faster than the speed of sound, you have a great deal of responsibility not only for the care of millions of dollars of equipment, but the lives of the pilot and crew, and the military members on the ground that aircraft is supporting. Do you see yourself as someone who can handle this type of responsibility? How about the Crew Chief of the Air Force Demonstration Team - The Thunder Birds. Today's Air Force is equipped with some of the world’s most sophisticated electronic systems in it's aircraft - jets, planes, and helicopters. Avionics Test Station and Components specialists (AFSC 2A0X1) are responsible for ensuring that the complex electronic systems remain perfectly calibrated. These professionals inspect and maintain everything from aircraft radar and weapons control to the testing equipment essential to the maintenance process. The air crew works each day until the aircraft are ready and operationally safe for service. When the crew and these aircraft are deployed, every system has to be in perfect working order as it is a matter of life, death, and mission success. Inspects, maintains, programs, and calibrates avionics equipment, SE, and aircraft components. Removes and replaces assembly components using hand tools, soldering devices, and electronic instruments. Repairs EW systems and pods, sensor systems and components, wiring harnesses and interconnecting cables. Services, replaces, and cleans filtration and cooling components, and performs maintenance on test stations and avionics SE. Repairs amplifier and logic circuits; microwave equipment; servomechanisms; radio frequency circuits; video displays; and power supply circuits. Loads computer programs. Aligns, calibrates, and modifies avionics test equipment, SE, and aircraft components. Manages integrated avionics activities and complies with directives, policies, and procedures. Complies with maintenance standards. Initiates deficiency reports, maintenance analysis documents, technical data changes, and equipment records. Interprets, establishes, and complies with training, security, and safety standards. Ensures compliance with directives governing handling, use, and disposal of hazardous waste and material. Records information on data collection forms and automated systems. Directs and controls maintenance, calibration, and inspection of integrated avionics test stations and aircraft components. Plans and organizes integrated avionics activities. Plans and organizes integrated avionics equipment assembly, calibration, repair, modification, and maintenance activities. Plans physical layout of facilities, and ensures SE and spare parts availability. 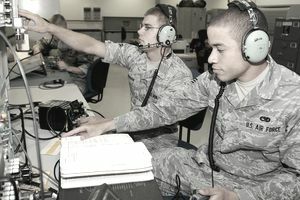 Knowledge is mandatory of: electrical theory and electronic fundamentals, including solid-state, binary, digital, octal, and hexadecimal numbering systems; metrology principles; Boolean algebra; computer logic, and programming principles and language; printed circuitry; microwave, radar, and electronic warfare principles; microminiature solid state devices; operating principles of avionics components supported by test stations; electrically actuated mechanical device theory; operating principles of basic measuring and testing devices; interpreting schematic, logic, data flow, and wiring diagrams; interpreting programming tables and technical publications; using, caring for, and applying special, standard, and common hand tools; interpreting testing, measuring, and referencing devices; concepts and application of applicable maintenance directives; Air Force supply procedures; and use and disposal of hazardous waste and material. Education. Completion of high school is desirable with courses in physics, algebra, trigonometry, and computer principles. Training. For award of AFSC 2A031X, completion of the applicable suffix basic avionics test station and components course is mandatory. 2A051X. Qualification in and possession of AFSC 2A031X. Also, experience in functions such as identifying performance and isolating malfunctions encountered with avionic components; using and repairing avionic electrical, electronic, and mechanical equipment; or aligning and calibrating avionic test stations and SE. 2A071X. Qualification in and possession of AFSC 2A051X. Also, experience performing or supervising functions such as installing, inspecting, repairing, or overhauling avionic test stations and SE. For award and retention of AFSC 2A031X/51X/71X, eligibility for a Secret security clearance, according to AFI 31-501, Personnel Security Program Management. Required Appitude Score : E-67 (Changed to E-70, effective 1 Jul 04).